Tofu is available in several different types of packages. 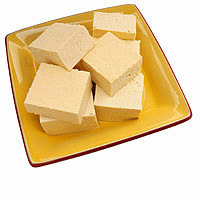 Tofu comes in a number of varieties: The traditional Japanese delicacy called silken tofu is produced when the curds are left undrained and unpressed. This tofu has a soft, delicate texture, somewhat like custard. The curds can also be pressed to varying degrees of firmness and are available as soft, regular, firm, and extra-firm tofu. The firmer the tofu, the better it holds its shape. Flavored tofu is also available. It may be infused with herbs and spices to produce a Mediterranean or curry flavor. Or, it is sometimes baked or steamed with soy sauce for a savory product that doesn’t require any other preparation. Reduced-fat tofu is also available.